1- Use a tennis ball – A great tool to soothe sore feet & massage unreachable knots. Check earlier posts to show you how! 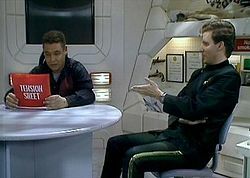 David Lister using Tension Sheets (bubble wrap, painted red) to de-stress on UK’s ‘Red Dwarf’. 3- A sheet of bubble wrap – or what the TV show ‘Red Dwarf’ calls a Tension Sheet. Popping the little bubbles whether one at a time, or all at once reduces stress level. I’ve even put a sheet down on a tiled floor & run an office chair over it. Yes, it looked silly, but I really felt a lot better when I ran out of bubbles to pop! 4- Aromatherapy – studies show using essential oils such as lavender and lemongrass reduces stress & increases calm. 5- Soothing music playlist– music soothes the savage beast, it can also reduce stress levels. I have a Silly Song playlist, so I can de-stress at the office or on the road. I even go as far as to give really silly ringtones to calls that can be stressful. That way when I hear them, it makes me laugh a little, taking the stress out of answering the phone. Music that tends to have a faster beat in stressful situations, tend to drive up stress levels. (Besides, who listens to ‘Bodies’ to de-stress?) You wouldn’t have to listen to it all day; just a few minutes when you’re stressed goes a long way! BONUS – A good Stretching routine- you’ve been sitting at your desk for a while, and you hadn’t stretched in a few hours, admit it. Get your blood moving & loosen up those tight muscles! Here are a few good ideas – what are YOURS? I’d love to know! Thanks! Which one(s) will you be trying, or better yet, what works best for YOU? Thank you. What’s your best tip for relieving stress at work?